"Gooey cookie bars, rich with chocolate, peanut butter and coconut." In one 13x9 inch baking dish, melt the butter. Sprinkle the graham cracker crumbs over the melted butter . Top with the coconut, then the sweetened condensed milk and bake for 25 minutes or until golden brown. In a saucepan over low heat melt the chocolate chips and peanut butter together. Stir until creamy and pour over the baked bars. Let cool thoroughly then cut into bars. Garnish with more flaked coconut. Store bars in an airtight container. Very yummy. Some other reviewers commented on the crust being too greasy, so I used 2 cups of graham crumbs. I made the rest as written and they turned out perfect. 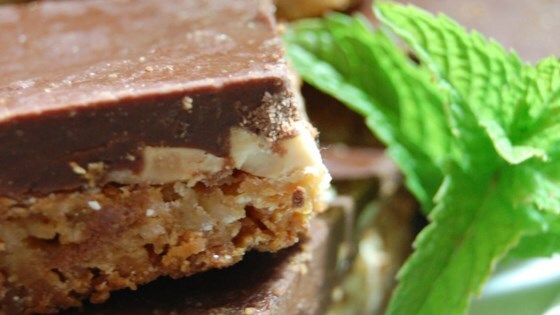 Good bar recipe, my kids loved them!! Don't try to melt chips in microwave like me! !